and i have missed the month of march. but my mother's backyard, soon to be mine for a while, is full of dogwood blossoms and pink azaleas, and a fig tree laden with leaves, and yesterday spring blew in through opened doors and windows and at last, at last, skye the cat moved from her perch on the back of my mother's couch to lay next to me, just one paw out to touch me, both of us baby stepping our way through this change. this couch will be the last of things to go, it gives her something to hide beneath while glassware is packed and cupboards emptied and appliances disappeared; she is confused by no refrigerator, a favorite perching spot gone, and yesterday when a man came by to look at my mother's car, she stood on the front porch, meowing and confused. but forward we move, and today is sunday, and it is april, and there is a baseball game in arlington awaiting me, a day off, some hours away from all of this too-much-change. we are almost there, almost ready for carpet to come up, almost ready for painting to begin - ceilings first - and i have pushed back my move time a couple of weeks. sometime in may, and the summer will be upon us as skye and i settle in to this new relationship, this will-be new space. she will have a different couch, but i will still be on it, pink toenails and all. this brought tears to my eyes, having thought of you all this time and your grief, but forgetting that our pets grieve, too. she must be lost. i am so glad she is reaching out to you. and so glad that you have a day off to do something you enjoy, to take your mind off things, to bring you smiles. she is the reason for all this & it is easy to forget. without her, the house would soon be on the market for sale. she is a compass that points me in the right direction when i am feeling sorry for myself - i remember that my mother loved her this much, to want her to live out her life in this place she knows as home. right now i sit here at work with lilycat, remembering that she, too, is adjusting to changes - me not here as much, me always distracted, me always busy. sometimes i think she thinks well, i had almost a year of undivided attention, the space between maggie and skye, and i worry about her. but the truth is lily saved me over the past year, and once the move is over, i will be here more, and i will feel less guilty. funny that these cats can make me feel guilty beyond what any person can do. rubbing lilycat's belly is like rubbing the buddha's belly - in fact,the buddha would say it is all the same, would he not? she is my touchstone. and so skye & i & lily will work it out. it will be more than fine. It was great to see a post from you, you'd been on my mind and I'd been thinking of you. Cats are a lot like us humans in that they too don't like change. Here's to the baby steps and the big steps that you're both facing since your mothers' passing. i loved that todays coming to read had new words from you. you remain often in my thoughts. your words stay with me long after i read them. your yard blossoms and leaves brings me hope for spring. we have snow so hard today, you cannot see the woods, and the ground is once again covered in white, as is all else, when we were just beginning to see evidence of brown dead grass. today, i need a cats belly to rub and nestle my toes into. Yes, I understand what Tilda writes, that it is so nice to have new words from you and I love this about skye, that she reaches out one paw toward you, such a perfect cat move! You, with both your kitties, are on a very interesting journey ... take good care. Cha-ch-ch-changes. Feel your way through them and settle in your heart space. oh this one got me .. feelings and so much change .. through misty eyes here I think of you and the cats and the journey your on.. big hugs form down the road under a dogwood tree!! The stories you tell are about to embark in a new direction, setting sail for new seas. I think that cat is one damned lucky cat. You sound at peace with all of this, maybe because you are taking your time? Whatever the reason. Lovely soft thoughts for a hard time. 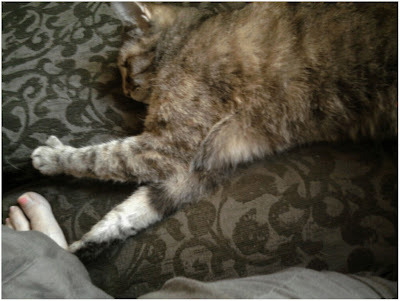 that one paw stretching out to just barely touch you just melt my heart. So good that she has you reach out to. Hope you enjoyed your day off, much needed I'm sure. I enjoyed visiting your blog today...I saw it and enjoyed your writings in Artful Blogging. Very sorry, however, to learn of your Mother's death. you brought back a very sad memory of my late husband and our cat. not a bad memory just a sad one. thank you, as always for your sensitive writing. If only we could take the pain of change away... from ourselves and our beloved pets who feel just as deeply as we do. But I can't help feeling a lightness around this change for you Debi. It feels good and right as you slowly adjust and make it work for you. I mean, I can't know for sure...only you do, but hmmm...it just feels right. It feels like you are being given the space to really stretch your wings. How interesting that you are surrounded by beings named Skye. I had the same thought as Jaime - the change feels positive, however I know it has to be hard, very hard at times.